Acrylic is known and sells under the Plexiglas® trademark and or trademarked as Perspex®. Profile Cut Shapes Laser & CNC router. Clear Plexiglas® allows natural flow of light, welcomes the outdoors in with added protection. 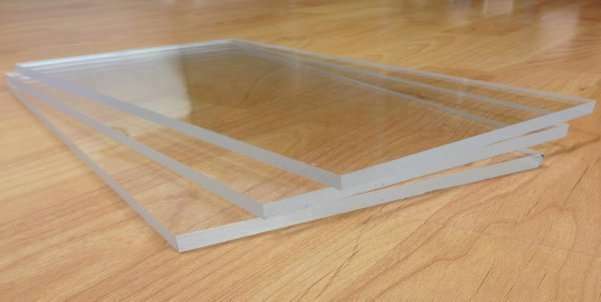 Plexiglas is an intelligent material. It’s characteristics are lightweight panels, impact resistance 17X stronger than glass and expels harmful UV Rays. The result is an eye catching touch that enlightens. When edges are polished, has crystal clarity with water-like edges. The dull grey or green edges of glass cannot match the clarity and brilliance of Plexiglas®. The material offers NATURAL UV-STABLE technology. No other material has such natural protection. Easy to fabricate and form into a variety of shapes and is readily decorated by means of vinyl decals, etching or engraving. Plexiglas® is a dream come true for architects, builders and designers. There are huge savings to be made in the construction / steelwork of Awnings structure, due to the weight of Plexiglas® being less than that of glass. Many plastics lose a considerable portion of their light transmission during use. Sheets may become darker. PLEXIGLAS® does not. Depending on material grade and region, clear-transparent sheets still retain up to 90% light transmission after 30 years of service life. This is one of the best transmission levels offered by any plastic. FULL SHEETS of Plexiglas® and Perspex® acrylic. We also Cut To Size.